The most important career skill -- possibly even the most important life skill -- of the new decade will be successfully managing distractions to get important stuff done. If you think you're a great multitasker, you're wrong. For example, people's performance and safety drops while talking on cell phones, as if they were drunk. It's well known that using a mobile while driving is unsafe, but here's the key issue that much conventional wisdom on this topic misses: it's not about being hands-free. Multiple studies have shown, whether hands-free or not, the attention we spend on talking on the phone comes at the expense of safety. The effect includes tunnel vision and slowed reaction times. Meanwhile email, instant messaging, meetings and voicemail are embedded into workplaces. New forms of communication, social networking, games, and mobile apps arrive constantly. It's up to you to police your time; no software will do this for you, and most employers take time management skills for granted. 1. Prioritize and work in sequence. Whenever you can, attack your tasks in priority order, one at a time. You might have more control over this than you think. 2. Block out specific times to work on specific tasks. Studies suggest that people are most productive when they switch tasks on a schedule, rather than based on when one's email pings. 3. When you're interrupted, make a mental bookmark. Take a moment to jot a note, or just repeat to yourself where you were, before you answer the phone. 4. Change your setting when you need to focus. This is one of my favorite techniques. Most offices have a free conference room, lounge chairs, or other area where you can hide from your phone, turn off your IM client, and get some work done. 5. Ask about interruptions when interviewing for a job. Hiring managers can ask "How do you deal with interruptions at work when you need to get the job done?" or "How do you work when you need to juggle multiple projects that demand your attention?" If you're interviewing, ask about hot-button topics like putting out fires, or what communications technologies coworkers use. 6. Unplug regularly. Make reflective time for yourself at least a few times a week, when you turn off your smartphone and walk away from Twitter. Give yourself a chance to actually think about your projects and priorities, instead of reading and reacting 24/7. Driven by the U.S. economic stimulus package, which earmarked billions of dollars to upgrade the nation's health information technology, user experience is in vogue across the American health industry. I saw the results of this at the 2010 Boston Mini-UPA conference last week. Five of the speaker topics referenced healthcare. One session gave an overview of testing medical devices for FDA validation, and the other speakers talked about healthcare in the context of patient websites, pharmaceutical branding, mobile design, and general tips on what makes the domain unique. When practitioners follow the money, they must be prepared for the special challenges in this field. Bureaucracy, paper records, and heavy regulation drastically slow the pace of healthcare innovation. I'm reminded of this every time I visit my doctor's small practice, composed of two full-time paper pushers, one nurse, and one physician. Shelves sag under dusty files, and every year I have to fill out and sign the same paper forms. Still, healthcare IT change is happening. My doctor now brings a laptop into the exam room and transmits prescriptions directly to the pharmacy. Now a chicken-scratched paper prescription cannot be misinterpreted at the pharmacy! At the conference I found privacy and openness conflicts remain a huge source of tension in healthcare user experience. UX designer Kate Brigham presented the website patientslikeme.com, which makes all its user information public. During Q&A, followup questions about privacy showed attendees didn't quite grok this bold approach. It reminded me of doubt about ecommerce safety ten to fifteen years ago, or distrust of ATM's even more years past. In both cases, careful customer experience research and design helped overcome reservations about a newer, more efficient way to accomplish things. Contrast the antiquated experience at many doctor's offices with the slick, computerized process at CVS MinuteClinics, where people browse appointments and services on a kiosk and a large display shows who's next. Healthcare is not immune to competition on usability. 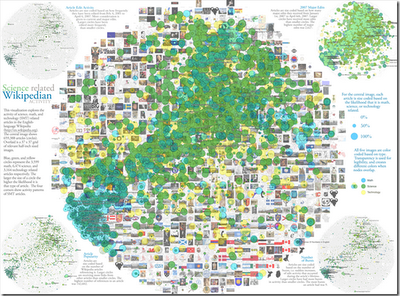 This week I reread the futuristic Berners-Lee article on the Semantic Web (pdf). It describes smart desktop software agents that can arrange appointments, delegate tasks to trusted family members, and even negotiate prices on behalf of their users. These agents depend on semantically tagged Web information -- open data that's been described in a standard way so machines can use it. Nine years later, and depending on your perspective, this compelling vision still seems like mission impossible. Some major websites, such as ibm.com, are now built with validated, standards-driven code and tagged with semantic metadata for machines to repurpose at will. But, in a familiar chicken-and-egg adoption cycle, most organizations with useful online data are still waiting for applications to come along and justify the effort of recoding for the semantic web. Information architects get the value of semantic data applications, but end users like you and me don't seem to miss it much. I believe we put up with it because we already have an secret agent of our own: Agent Google. No one's better at pulling the meaning out of disparate web documents and making information findable. Google doesn't need the semantic web -- they've already semanticized it for their own search results and ad serving. Of course, there's a big difference between desktop software drawing on open data formats, and Agent Google's secret data factories. Perhaps the most significant change in the Web since Berners-Lee wrote his article is the mass migration of personal data into the cloud. Many people now routinely write all their documents, share their schedules, post their photos and video, save all their email, and map their social lives online. Meanwhile, Facebook Connect and OpenID are bridging your data islands under identifiable accounts. Agent Google's near-omniscience is no news flash to many of us, but it's worth staying alert for alternatives. The White House's recent adoption of the semantic RDF and OWL standards may lead other organizations to publish their data in agent-friendly formats. Someday soon, you may finally have your own trustworthy semantic agent, with a license to gather data that's for your eyes only. This is the second time I've seen a Twitter link pyramid scheme in action. I first lost my innocence when my reliable Twitter source of fun quotes suddenly posted a spammy non-quote tweet. We exchanged angry comments, but apparently, out of the account's thousand followers, I was the only one to complain. These message strike me emotionally, by breaking down the central value premise I find in Twitter. I believe when people post messages, it's their thoughts in words, and not a corporation using them as a mouthpiece. If I'm following AmazonMP3, of course I know a business is posting the content. But when people I've met in real life post a commercial link without context, the metaphor shear is so abrupt and jarring, I know how the recipients of the first email spam must have felt. Imagine if most or all the people you follow on Twitter frequently entered contests this way. How could you tell when it was really them posting? Does it matter, as long as the content behind the link is interesting? It matters to me, but maybe I'm one in a thousand. What do you think? Update: Twitter spam links are similar to the recent Burger King offer to get a free Whopper if you drop 10 Facebook friends. It's different in that the 10 people affected weren't sent a spam link disguised as a real person's update. Still, it's another example of marketers experimenting with incentives to change people's behavior on social networks. Update 2: The equation changes completely for me if a Twitter friend edits the message explain the context before tweeting. I'm not sure it changes if the marketing is for a cause I approve of. I've finally installed Office 2007 on my PC, and I now fumble around performing tasks that were quick and familiar using the old Office interface. In particular, I miss the action oriented headers of the old hierarchical menus. I knew what to expect under Edit, View, and Format, but now each application within the suite has different top-level categories. Document styles live under Home in Powerpoint, for example, but in Word they live under Design. There's nothing surprising about these transition pains. No one I've ever talked to enjoys learning a new interface to accomplish the same tasks. I understand, though, why Microsoft tied on their Ribbon. They ran a survey on new features for Office, and found most of what people were asking for was already hidden in the software. What else could they do but introduce new interface? It's less than a year after the Ribbon was first introduced, and it appears to be faring well. In addition to some vague articles touting the Ribbon's success, I'm seeing ribbons appear in new Web applications like FotoFlexer. Jakob Nielsen calls the adoption rate of the Ribbon "surprisingly strong." I wonder, though, what will happen when Microsoft patents the ribbon UI and requires companies to accept their licensing agreement to use it. 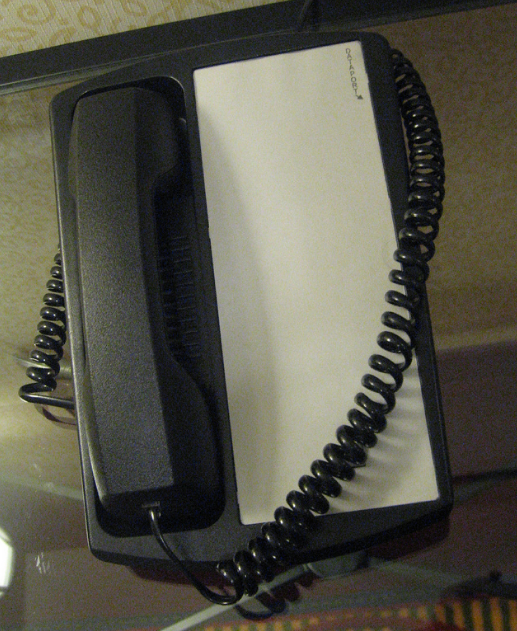 I saw a hotel telephone last week that perfectly illustrates one of my favorite themes: simple is not always more usable. Here's a phone without any buttons. It doesn't get much simpler than that! Yet most people wouldn't even consider it a real telephone, because essential features are missing. How do you choose who you want to call? If a simple interface is your goal, it's critical to know the essential feature set. Simplify past a certain point, and you risk making your product or system unrecognizable. The best way to know the essential feature set is user research, although a survey of competitive products can substitute in the short term. But wait, there's more! Over time, the essential feature set increases for a given product. Early phones used to come like this one, with no controls other than a crank to signal an operator to help you. These days, most people won't buy a phone without a display for caller ID, redial and volume controls, and more. Heck, wired phones can seem like a relic compared with the versatility of mobiles. The ultimate goal is user satisfaction. Meet expectations by delivering the essential feature set, then delight users with a better, more usable interface on those features. What will we do with cognitive surplus? Bloggers I follow are buzzing about the Clay Shirky talk on the post-TV cognitive surplus. I understood it as "Passive TV-style media is going away, replaced by the interactive Internet, and now we'll all use our free time being busy content creators." His actual talk, however, was more nuanced and believable than a simple, en-masse transition of humanity from passive consumers to active creators. He managed to address two shortcomings I predicted with cognitive surplus. TV is fodder for social interaction. When my coworkers chat about the TV shows Lost or 30 Rock, I can't do much but smile and nod, because I watch very little TV. In the workplace, opting out of TV talk is a real sacrifice. In diverse c ontemporary society, what can you chat with people about, without risk of confusion or giving offense? It's just easier to have safe common experiences outside of work to talk about. However, Shirky was careful to emphasize that even a small amount of redirected TV time could spawn multiple Wikipedias per year of Net content. If it only takes a little attention to contribute, it's easy to see people playing an online game or posting to an online community while watching TV. They're doing it now, all the time. TV is rest time. People like being passive. Depending on what you read, television is either the world's most tranquilizing addiction, or a cognitively demanding cultural simulator. Either way, for a long time pundits doubted the PC would ever replace the TV, because peoples' behavior is quite different using these two mediums. No one "watches computer," and no one "uses TV." It's not easy to find exactly what the difference is. Supporting these naysayers, hybrid systems like WebTV and the Apple TV have had no great commercial success. In the past ten years, though, television has evolved into convergence with personal computing. Or rather, the TV interface, not the content, is much more like computers now. Tivo changed everything, and new TV sites like Hulu promise to change things further. My take is that we still must make online content creation easier. It's great that people can watch less TV, but creating anything interesting online is still inconsistent and frustrating for most people. We need standardized widgets for common functions, so that every rich interface isn't a new learning experience for users. We must clearly communicate state in Web applications, so people always know what to expect from our tools. And we need very quick feedback and results when using these applications. Your keyboard and mouse are going away. Will usability go with them? I had one of those blogosphere epiphanies last night, where different people opining about different stuff all came together for me. It started with the new report I have to read from Bill Buxton's Microsoft research group about what computing interfaces will be like in 2020. Add recent posts from Oz about eye tracking replacing mice, combined with other notes about the decline in personal computing, and even some near sci-fi news about operating computers with brainwaves, and the trend crystallizes. Hey, take a good look at your computer, and compare it to machines you used ten years ago. CRT monitors are mostly gone. Disk drives and ports have changed, shrank, and started to disappear in favor of wireless. The oldest parts of your PC are the forty-five year old mouse and of course the two-hundred year old keyboard. These venerable peripherals are on the way out now. When I entered the workforce, people were beginning to accept as inevitable that everyone would change jobs many times in their lifetimes. I think the next great trend will be people in technology changing careers completely, several times in a lifetime. If within twenty years everyone is communicating with everyday devices by touch, eye tracking, or brainwaves, the concept of an interface will be radically different. Usability as we know it today could become obsolete. Even within ten years, as people use next-gen iPhones and Google Android devices to accomplish everything they once had to sit and type to do, usability professionals can expect many of their skills to become dated. We can be reasonably confident that cognitive psychology will remain relevant, at least, since ten, twenty, or a hundred years are not enough to evolve us into bigger brains. 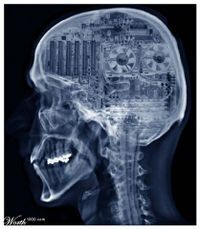 But think again -- with chips in our brains enhancing working memory, grabbing any needed information instantly from a ubiquitous Net, and performing complex calculations trivially, many of the tasks we need a computer interface for today will become easy as thought. Humans will not have the same cognitive limitations we're used to working within. I used to think all this stuff was either science fiction, or maybe for future generations to worry about. But I think everything in this post will be happening in my lifetime. And I wonder what I'll be doing for work as a result. Check out those links and let me know what you think. Get the audience right. Invitations should have gone only to GM owners, not the whole web. Don't put users in a very small box or they'll rebel. 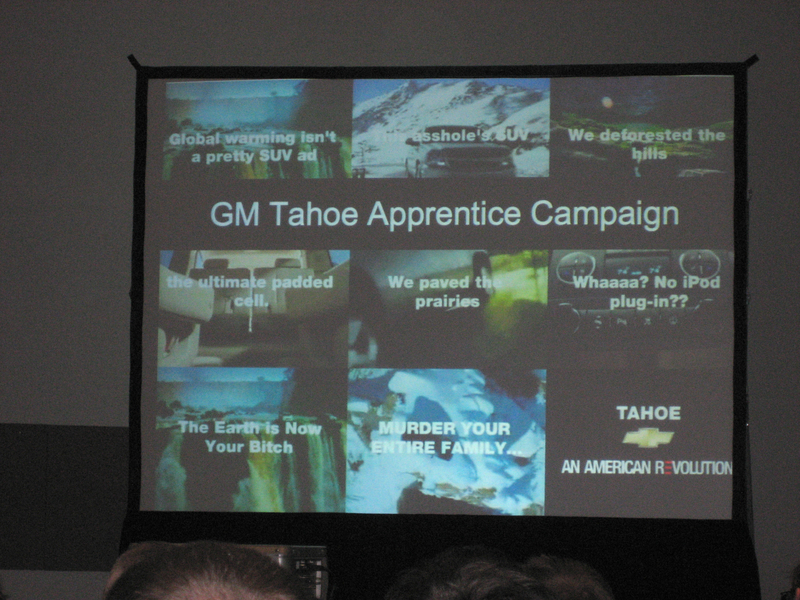 GM only allowed captioning and resequencing of content. Don't be greedy with your content. Allow people to import their own graphics, collaborate, and share what they create. Don't be selfish. Believe it or not, GM didn't even allow users to sign their creations! While there were other good lesson to be had, every other session, it seemed, had social networking in the title. That felt faddish to me. Not a term you often hear, but it came up a few times in Austin. Broad interests and diverse experiences will make you smarter and age better. A limber brain, of course, also relates to creativity and problem solving. In the businesses I've worked for, you see ten PCs for every Mac. At SXSW, the ratio was reversed. Blackberry was doing a little better, but there still was a great preponderance of iPhones among the smartphone-wielding masses. You can see more of my random SXSW photos here. Ouch. It's been awhile since I blogged! I can weigh the pros and cons of my new MacBook, but when I add them up, 2 + 2 = 5. There's something hard to quantify about the way the whole system works together, predictably and well. I guess with Wintel boxes, I tend to assume that commonplace interactions will not go well the first time. Whether it's hooking up a new printer, installing a new application, or even plugging in a new mouse, I don't expect it to work without plenty of tweaking and friction. Most likely this relates to the enormously broad array of legacy hardware and software that Windows must be compatible with. I once got in a conversation with a former Microsoft employee about the long turnaround time on bugfixes for Office. He gave me a number of good reasons, including the many third-party add-ons the product supports, and the many platforms it runs on. Nevertheless, I instantly had to bite my tongue to keep from interrupting that I simply didn't care about any of those features. Clearly near-universal compatibility is important to Microsoft, but not to me, and probably not to any individual user. I wanted to respond that Microsoft needed to meet my individual needs faster, or I wouldn't want to stick around. Our different value systems meant we could barely understand each other's point. Macs on OSX are unencumbered by decades of legacy code and hardware, and if I had to guess, that makes everything run just a little smoother. That's good enough for me.